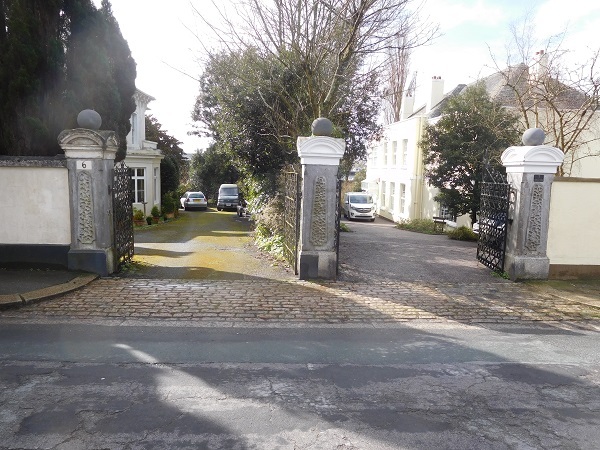 Osborne Villas – Stoke, Plymouth. Osborne Villas is situated in Stoke, Plymouth. Set within a conservation area, the properties here are styled on ‘Italianate’ architecture which was very popular during the 19th century. This style of architecture was inspired by 16th-century Italian Renaissance architecture. A delivery lorry had hit one of the pillars to the entrance and luckily it hadn’t toppled over but it had shunted it off its base by a couple of inches. The pillar itself is made from one solid piece of Plymouth limestone. 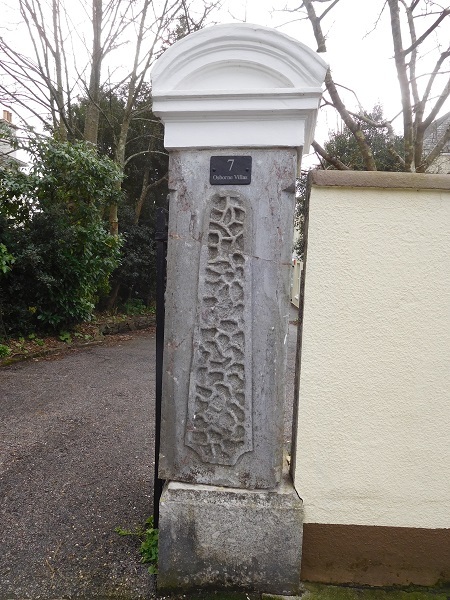 The base is Dartmoor granite and the top is cast in cement. In total the pillar weighs almost two tons in weight. We were asked if we could get the pillar back to its original position. 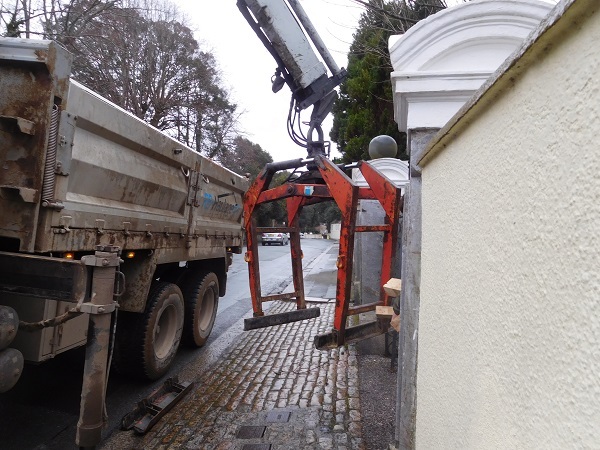 First thing we had to do was to remove the heavy iron gate fixed to the pillar. The pillar had a natural quartz vein running all the way through the stone and we had to be mindful of this during its re-positioning. Veins are the products of minerals moving through vents in the limestone during its formation. Over millions of years, these mineral veins are formed from shells and dead marine organisms and they are a common feature found within sedimentary stone especially limestone. They don’t usually become a cause for concern but if it wasn’t lifted correctly it was possible the pillar could fracture at this point and break in two. And we certainly didn’t want that to happen! 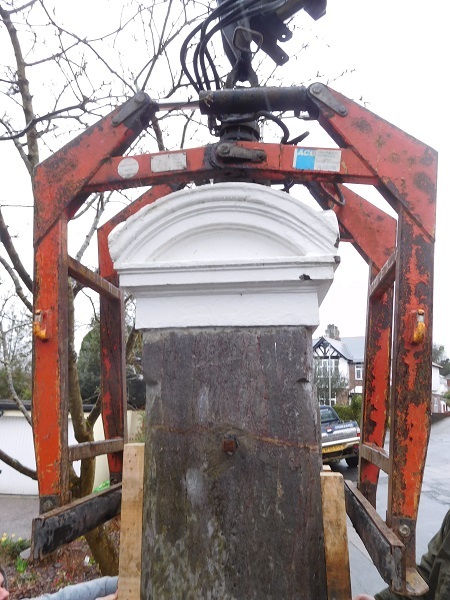 A lorry was arranged that had a hydraulic block grab with a lifting capacity of two tons to lift if back into position. Along with chamfered reveals, the pillar has a ‘vermiculated’ pattern carved in ‘bas-relief’ on both the front and the back. 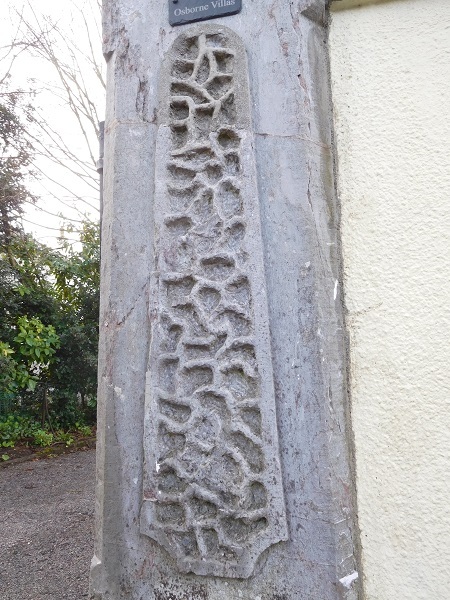 When stone is finished with an external surface like this, rough shapes may be chiselled or drilled into the stone by a technique known as ‘vermiculation’ (vermiculate rustication or vermicular rustication), originating from the Latin vermiculus which means ‘little worm’, because the shapes resemble the tracks that worms make in wet mud or sand. 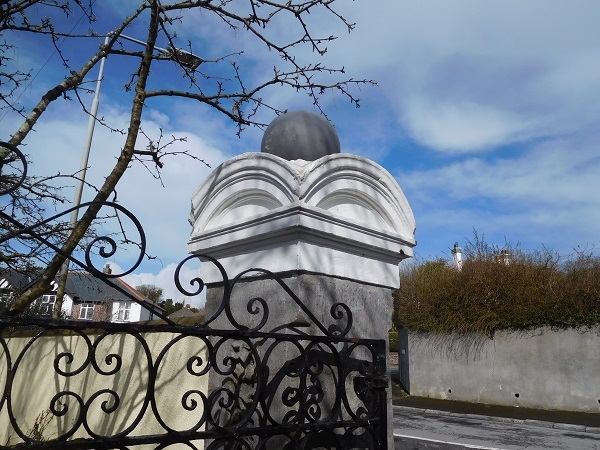 Carved vermiculation requires a good deal of careful masonry skill and is often used over small areas of stone to highlight them. 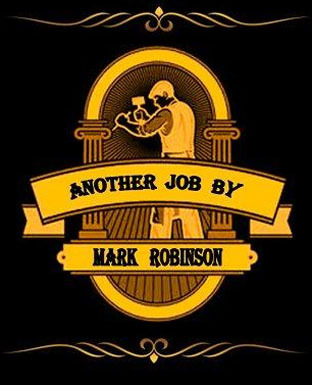 There are no set templets to carve this type of pattern in stone, they are created freehand and require a good eye and plenty of experience to produce them. 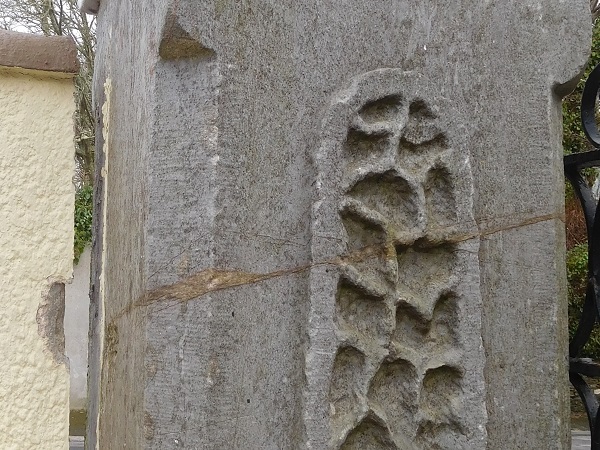 Visually, unique differences between individual blocks of stone are very often seen, probably because different stonecarvers interpret their patterns slightly differently, or their skill levels vary. 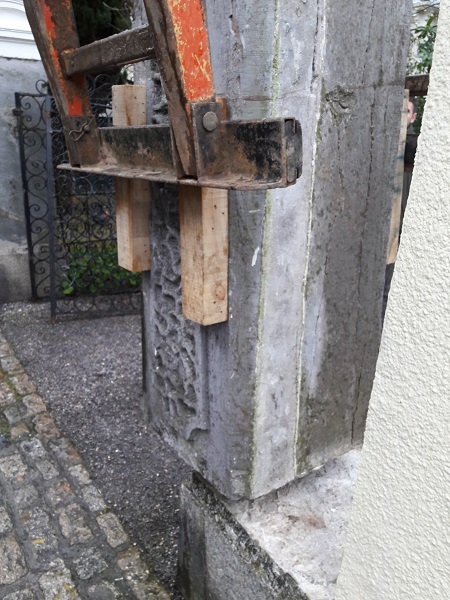 Wooden blocks were placed against the stone on both sides of the pillar. This was done for two reasons. First of all the wooden blocks would give a larger surface area to grip the stone when lifted, secondly and more importantly it kept the pinch bars of the block grab off the surface of the protruding vermiculated pattern and not cause any potential damage. 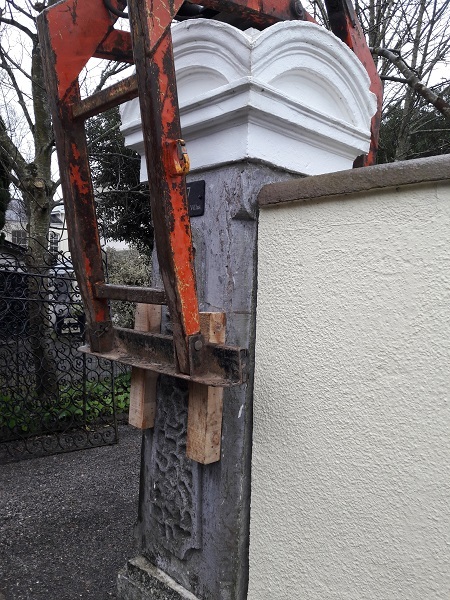 The blocks were placed below the quartz vein ensuring that no undue stress was placed on the pillar whilst it was being lifted. The pillar was then lifted off its base so the bed joint could be thoroughly cleaned. 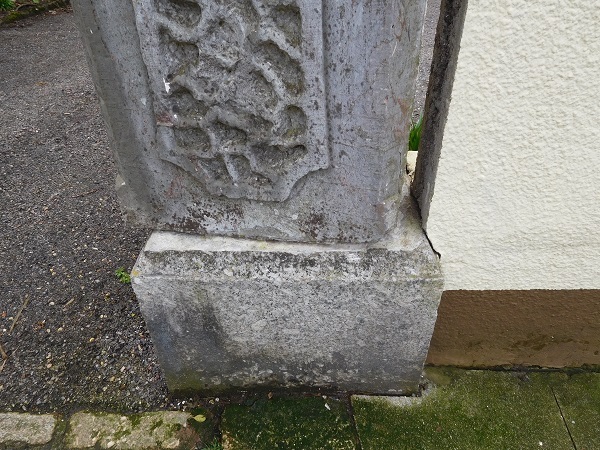 A lime mortar bed was laid and the pillar then set back into its original upright position. 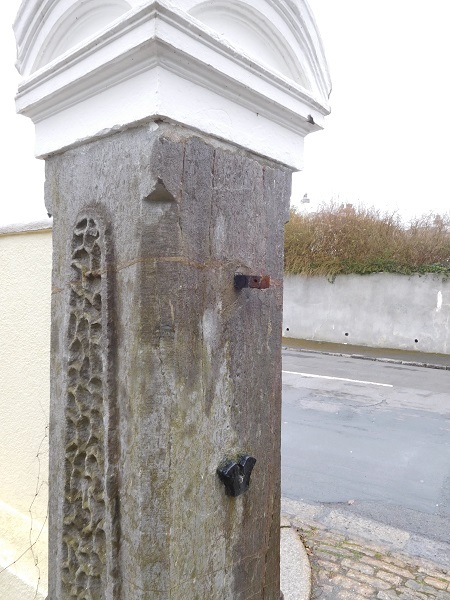 Once positioned, holes were then drilled diagonally through the back of the concrete block wall and into the limestone pillar and dowels set in with epoxy resin. This was not done to stabilize the pillar as such but to tie the wall to the pillar. 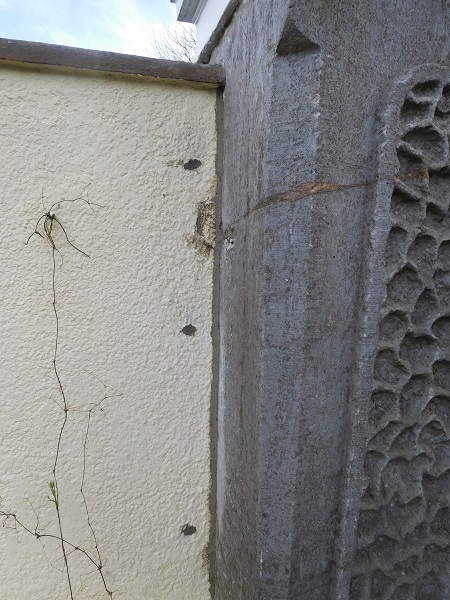 The joint between the wall and pillar was then pointed in. 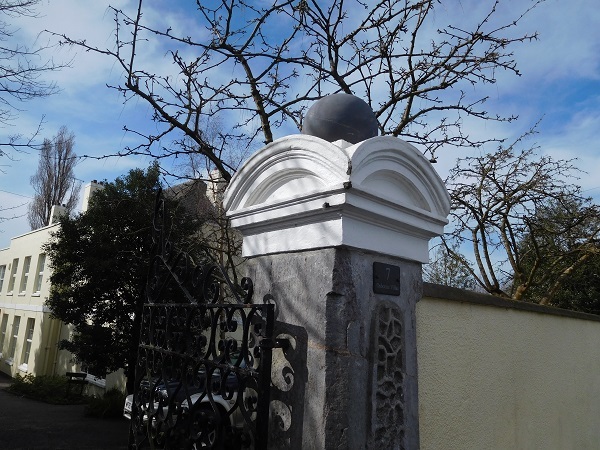 Another issue we had to deal with was the ball on top of the pillar. When the lorry had hit the pillar in the first place, the ball on top fell off and broke into three pieces. 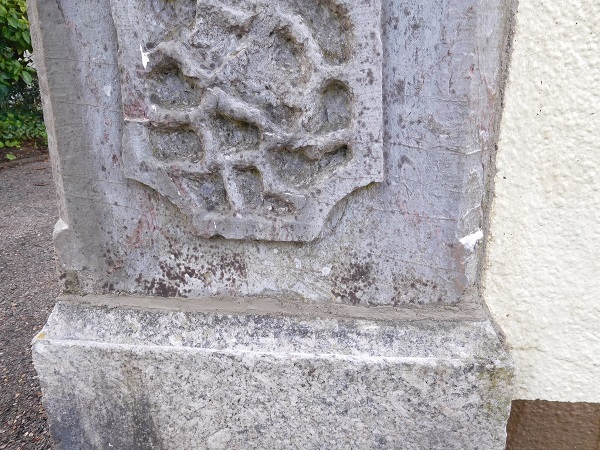 The ball was not original to the pillar and was made of terracotta. Originally the ball would of been cast in cement just like the capping and this ball feature would of had a ‘Socle’. A socle is a term for a plinth or base on which the ball sits on. 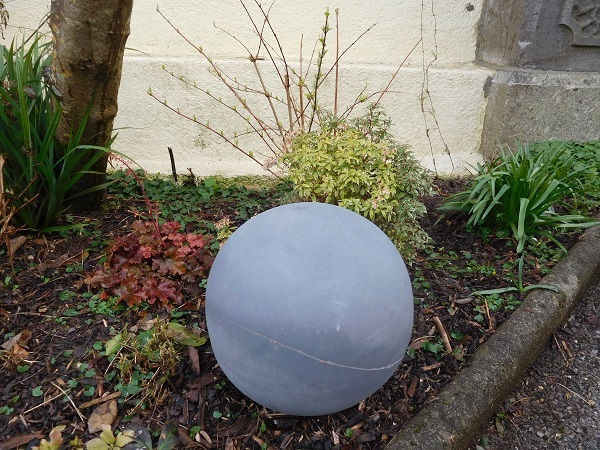 The terracotta ball was glued back together in our workshop using epoxy. 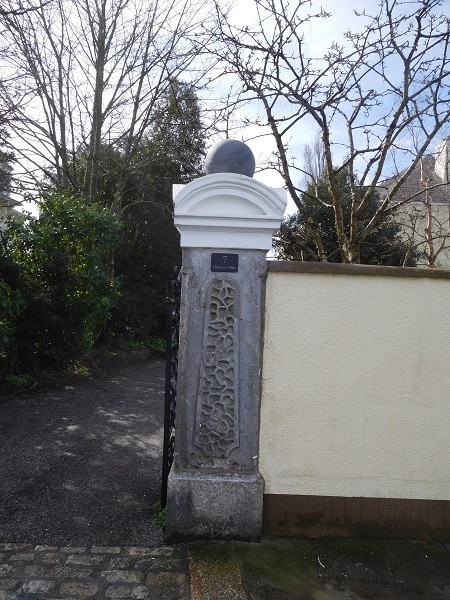 On completion of the work the ball was set back on top of the pillar and the gate put back.